The MEF, formerly known as Metro Ethernet Forum, announced this week that Ciena’s 8700 Packetwave® Platform and 3926m Service Aggregation Switch are some of the first products to receive the MEF 3.0 certification. Learn more about this significant milestone, how the certification process has evolved and why this is a good thing for our customers. The continued growth in Ethernet services market has been aided and promoted extensively by the ongoing efforts within the MEF. Their efforts have evolved to support more than specifications and, as of late, more than just Ethernet. But one initiative that has been a constant and somewhat unique to the MEF, is the certification program that certifies three key capabilities: vendor gear, operator services and professional knowledge. When MEF launched it’s MEF 3.0 vision last year, certification was seen as one of the key indicators as evidence for adoption by the industry. 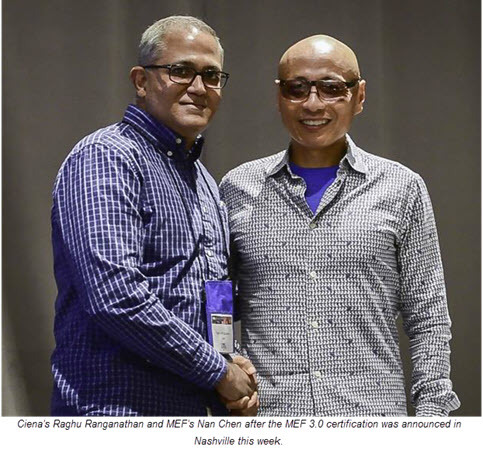 At MEF’s annual meeting in Nashville, TN this week, the first successful certified products were announced and Ciena is proud to be among them. Ciena’s 8700 Packetwave® Platform and 3926m Service Aggregation Switch are the first to be added to the list and receive the stamp of approval. Important as they are, these are more than just pretty certificates to hang on our wall. The MEF 3.0 certification program itself has been totally redesigned to reflect the agile nature of standards these days. In the past, getting certified implied a lot of heavy lifting (sometimes literally!). Typically, telecom gear had to be shipped to Iometrix (MEF’s officially sanctioned test lab) and engineers had to support the testing efforts in real time and on-site. Iterations of tests often required weeks if not months of effort in configuring the gear and scheduling resources. Taking a cue from the larger industry trend, the folks at Iometrix have now deployed a virtualized certification platform they call labinthesky. The new agile platform uses a virtual network function test application running on a white box which accesses the test engine in the cloud (in this case Amazon Web Services). Results are then uploaded to Iometrix for verification and ultimate approval of the certification. A user portal provides a convenient workflow to facilitate the work and review results. At Ciena we have taken the further step of integrating the testing into our product development process so that certification is not an afterthought, but an integral part of our ongoing testing and release planning. The new platform allows us to perform testing on demand and as often as needed as both our products and the MEF specifications evolve. As additional products from the Ciena portfolio are added, the status is reflected in real time on the MEF online certification registry. This ensures three things: our portfolio is compliant to MEF specification(s), our customer’s efforts at certifying at the service level are streamlined, and adoption of our platforms in a multi-vendor environment is far less risky. And that point about our customers is important. At Ciena we have taken the further step of integrating the testing into our product development process so that certification is not an afterthought, but an integral part of our ongoing testing and release planning. Integrating vendor gear into an active and growing network is no small task – akin to performing maintenance a jet engine while in flight. So, having a certified platform that has already been tested to deliver MEF services per the well-established specifications is a significant step towards a safe and timely landing. As MEF progresses towards specifications for orchestrated services and multi-service certifications (think beyond Ethernet), the test suites will evolve as new specifications come to light. The virtualized test environment will be vital in our ability to reflect the latest and greatest advancements. To find out more about Ciena’s MEF certification efforts check out www.ciena.com/packets or the MEF site at www.mef.net. Can Orchestrating an End-to-End Network Slice Be as Easy as 1-2-3? Commencing countdown: It’s time for Packet Networking Summer Camp!